This log is intended to give sailors an idea of life aboard a sailing boat in the Baltic Sea and to motivate them to sail there. The tour took us anti-clockwise down the Swedish coast, over to Denmark then Germany, Poland, Lithuania, Latvia, Estonia, Finland, Åland and follow the Swedish coast to Mem then through the Gøta canal to Gothenberg. A clear blue sky, sunshine and SW wind 15-18 kts. gave us a perfect start on Sunday morning. 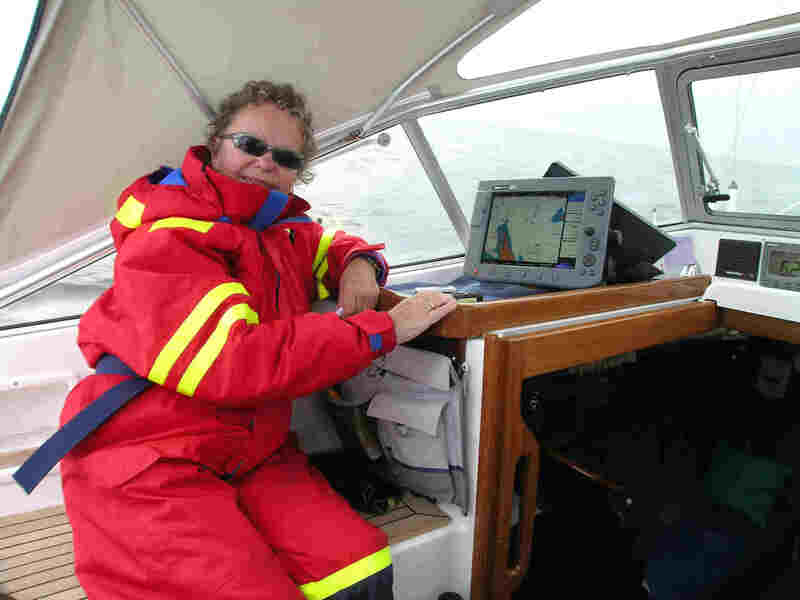 We have Edel and Ingvar Haukeland as crew as far as Kiel in Germany. High winds several days previously promised a rough crossing over the Olso fjord and then southwards past the Hvaler islands to Sweden. Everything functioned well though we had to change to motor sailing further south. We had an amazingly fine first day sail, 67 nm. to Smøgen (58 21,90N / 11 14,527E) in 10 hours. and felt that we deserved our anchor dram after mooring up!We have already observed that the summer season hasn't begun in Sweden. Next to no boats at sea, we had the canals all to ourselves and no kiosks or diesel stations are open. The only advantage is that there are no harbour fees to pay either! Dull weather, some rain and little or no wind meant motoring south to Marstrand (57 53,45N / 11 34,58E) for a short stop before continuing to the charming old fishing village, Kallø Knipplan (57 45,01N / 11 39 18E). Total distance today 44nm. We.ve had time for a walk around the island and a chat with some of the locals before enjoying our delicious turkey dinner. Roast turkey: Fill a mixture of butter end fresh herbs such as coriander, parsley and basilikum into a pocket cut into the turkey breast. Fix with toothpicks and brown both sides in a frying pan. Transfer to a baking dish lined with foil and add 1-2 dl of white wine, pepper and salt. Close the foil to make a tight package then roast for about 45 min.in the oven. Serve, sliced, with rice and a sauce made from the gravy plus 1dl coconut milk, some chille pepper, soy sauce and tomato purre to taste. Good net connection here. Next morning was cloudy but dry. We sailed out at 7am towards Anholt, 56 42,9N / 11 30,5 E. The sky cleared up making our 10 hour sail pleasant in the sunshine. Few boats around in this very shallow sea area made navigation a dream and gave us time to experiment with our new equipment. AIS (Automatic Identification System) is fantastic. We called up one ship, by name, about to cross our track to be assured that we had been observed and to be told that he was manouvering behind us. Distance 65 nm., motoring the last few hours. The vast expanse of shallow waters and the lack of traffic made sailing feel like an exercise in patience to the skipper. Anholt island was perhaps at its best with plenty of space in the harbour, only a couple of German boats, one Swedish, one Swiss, one other Norwegian and some Danish vessels. Rhododendron, hawthorn, lilac, laburnum, rosa rugosa and many others trees and bushes were in full bloom, lambs played around in the fields with some of the largest sheep we've ever seen. A walk round the island including a visit to Anholt Kro, then dinner with the captain's cured salmon as main course followed by fantastic music (clarinett and accordian) from the neighbouring Swedish boat made the day! No internet connection possible. Blue sky and sunshine when we sailed S. from Anholt at 7.40 am. 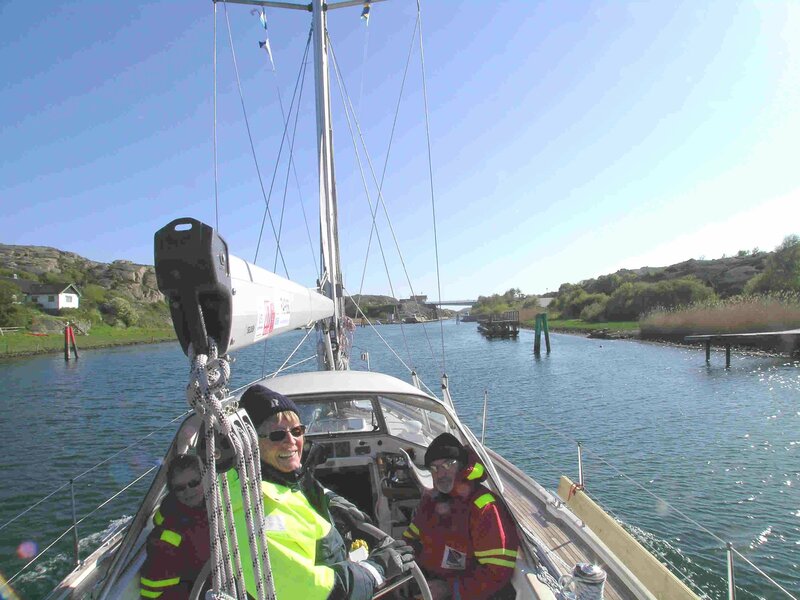 Our planned port - Ballen on the east coast of Samsø 55 49,0 N / 10 38,4 E. Wind from NW 6-9 m/s gave max. sailing conditions until midday when we had to start the motor. During this first week of transport to Kiel, with relatively long distances each day, we prefer the speed to be over 5 nm/h. Still shallow waters with less than 1m under our keel at times. We passed Vejro with windmills at sea and felt we were sailing slalom between sandbanks. We moored up in Ballen at 5pm, having covered 65 nm. mostly Danish boats but 2 Germans and us. Weather for shorts ashore, local strawberries had been for sale at the local pay yourself fresh veg.and fruit stall, but we came too late to get any. Friendly harbourmaster with weather forecast printed out on request and advice on our route south to Kiel. No card terminal, no wish to accept Norwegian money and the nearest hole in the wall 5 km away gave us the only option - a drink served by a service-minded barkeeper in the local restaurant/bar who allowed us an extra cash take-out! Ballen was a pretty little village with several shops (all closing at 6pm), restaurants, art gallery and local craft products. Another early, calm, start, 6am, for the longest legg of the transport to Kiel, our goal being Bagenkop, 54 45,2 N / 10,40,3 E. lying on the SW coast of the island Langeland. 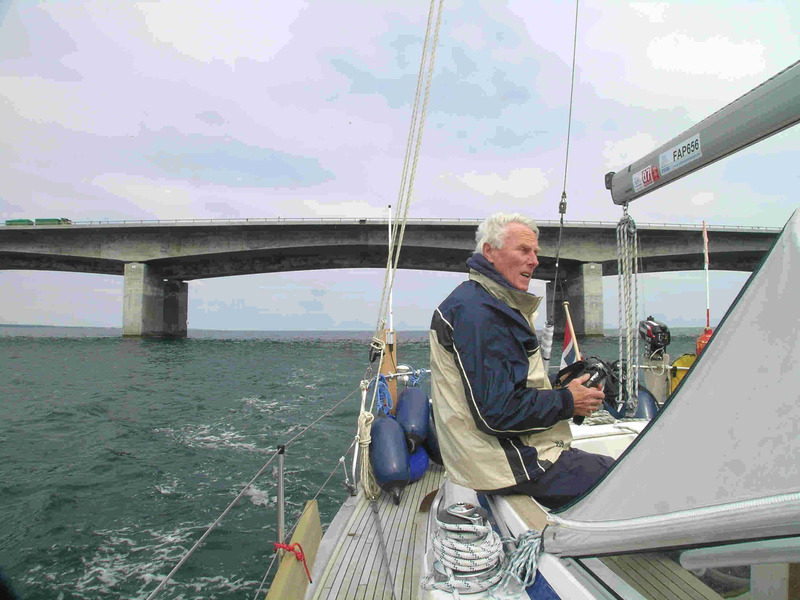 The trip was exciting for the crew, particularily as we passed under the westermost bridge in "Store Beltet". Our mast + equipment reaches 17,60 m over sea level and the bridge was 18m high! Breathtaking to say the least of it. We kept to the west side of the channel and the next challenge was the narrow, dredged track on either side og Rudkjøping bridge with currents 2,5 kts. against us. Just S. of the bridge we met Ærø ferry, taking up all the breadth of the track but we managed to keep afloat behind a green buoy while it passed. We had to motor eastwards past Styrnø all the way to Marstal on Ærø then westwards again after passing all the shallows, to get to Bagenkop. the harbour has 120 guest moorings and almost all were taken up by German boats, only 2 Dutch boats and one other Norwegian as far as we could see. Whitsun weekend sailors! The harbour was well equiped, there was a reasonably good store for food and wines and many interesting people to talk to, and gain information from. We enjoyed our Fenalår (smoked cured leg of lamb) along with scrambled egg, potato salad etc. follwed by strawberries then coffee and the captain's contribution - cognac and cigarillos for all! Potato salad: cut the potatoes into cubes and boil in water with 2-3 tablespoons of vinegar and a little salt until almost ready. Pour off the water, add some dried oregano or basilikum or fresh herbs, black pepper and enough majones to coat the potatoes. Mix well and add salt if necessary. Dead calm, sunshine and a little haze as we left Langeland at 5.30 am. Not enough wind to sail to Kiel, old Olympia harbour, Düsternbrook, 54 20,4N / 10 09,6E. An uneventful trip, VHF communication difficult to understand, no internet connection in the harbour area as yet. We change crew here and Haukelands have taken the ferry home. The first stretch of our expedition is over and has been fantastic and the temperature is now over 20 deg.C. We had 2 days in Kiel in warm but windy and rather wet weather. 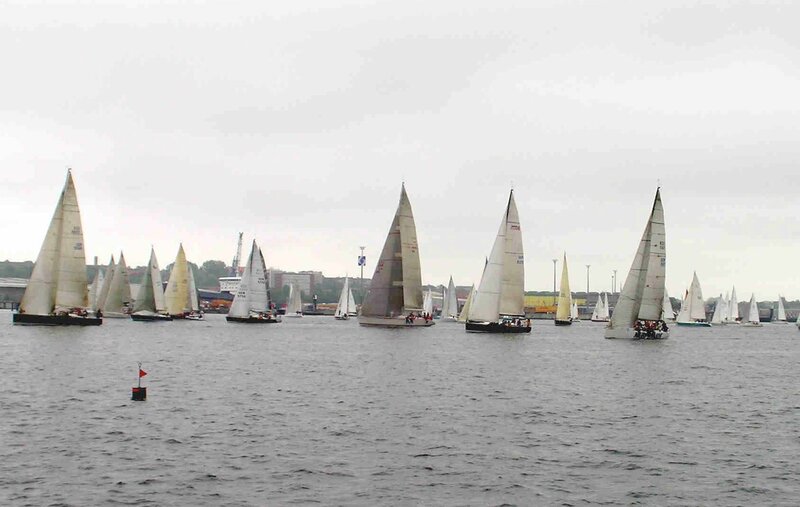 Saw the start of the regatta of the year Kiel to Eckørnførde. Visited some museums and met the crew of a Latvian boat, EVIJA, on its maiden journey from S. France to Riga. 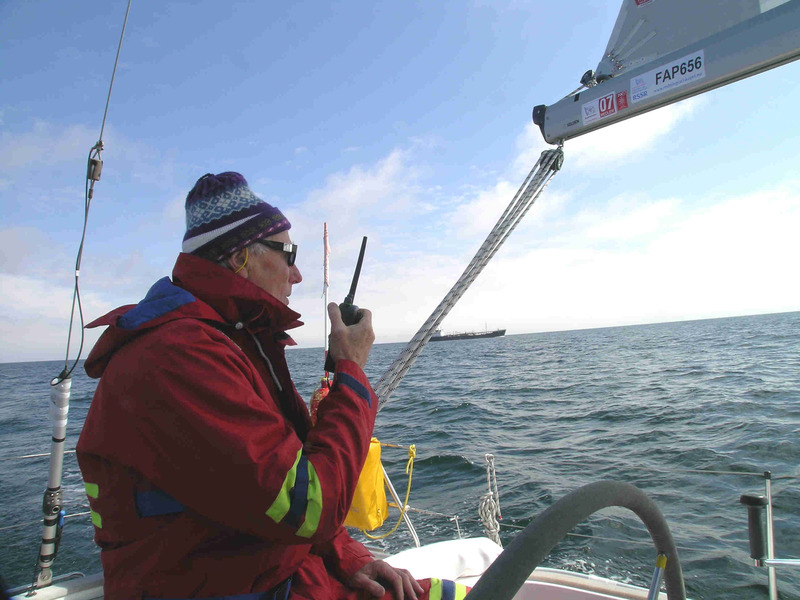 New sailing crew member Ingvald Godal joined us on 26th.May. We paid 28 Euro for two nights in the Dünsternbrook marina. We visited the maritime museum and found a Hansa kog at the nearby quay. One of the The German coastguard ships was in harbour and we had the "privilege" of meetinfg them several times later. After a pleasant and informative lunch with our new Latvian freinds we set off for Heilighafen 54 22,0 N / 10 59,0E. The wind had decreased from 12 sek/m so we motored out of Kiel bay against the sea, then on to Heligenhafen with some sailing before the thunder and lightning started. 5,5 hours and 37nm. Heavy rain kept us aboard for dinner and the rest of the evening, after our arrival at the outer harbour at 9pm. Harbour fee 15 euro. Our next port of call, Wismar, 53 54,0 N / 11 26 E, was 39nm away. Little wind and narrow channels to navigate in made us resort to our motor again. We had a fine day in the old Hanseatic town,Wismar learning more of it's history and enjoying local specialities. The temp. was over 20deg. but it rained all evening and night. Good harbour facilities at Westhafn, harbour fee 18 euro, still no internet connection. We took time to store up at a good supermarket 5 min. from the harbour before going to sea again. Thunder showers and heavy winds against kept us from leaving early. The shallow sea was pretty rough, particularily at depths under 5 m. No sailing today either, 42 mn to Warnemünde, 54 11 N / 12 05 E. We saw a copy of the Hansa Kogg out at sea with tourists on board. All three of us are thriving on this relaxed way of life. The book NV Havnelods tlle us that there areinternet possibilities at Warnemünde - I certainly hope so! There were plenty of cafes, restaurants and shops of all sorts including bakeries but not an ordinary grocer. I noticed many lovely old pharmacies still in use both here and in other towns, as oppose to Norway, where most pharmacies are modern, rather sterile looking and alike. The supermarket was too far away to spend time going to, when there were many more interesting things to see and do. The marina was in the center of the town, and of high standard, costing 18 euro per night, 7 euro extra for 24 hours good internet connection. Ingvald is exploring the theory that Olav Trygvadson was murdered here in the eastery sound of Stralsund by the plot of the Danish and Swedish kings. He had been in Poland and was on his way back home after collecting the belongings of his new Russian wife. We discussed the viking period of Rügen with the curator at Stralsund museum. The old maps of Rügen has many norse names and a large gold treasure was found here believed to come from the norse kings, Harald Blåtann. We stayed for 2 nights then left early for Peenemunde , Krøslin 54 07,3N / 13 45,4 E. The good sunny weather continued as we sailed to Peenemünde 30 nm, with a brief stop at the German war museum where V1 and V2 rockets were designed and produced. We had our first encounter with the German naval authorities, reprimanding us for cutting a corner into the fairway and going in front of their vessel. The marina at Krøslin was relatively new and had moorings for many local boats and visiting yachts. The small village had a bakery and a "supermarket" selling next to nothing, Our supplies for dinner ingredients were getting low, but we had a great meal of fenalår again with potato salad and scrambled egg. No internet here, 18 euro per night. No other foreign boats in the harbour but many Germans preparing for a regatta the following day. With rain and dull weather and wind up to gale force from NE out at sea, we were glad to be sailing inland chanels. We started early to get through the Wolgast bridge at 7;45. Wolgast was a small cosy looking town which would probably have been a better place to stay in than Krøslin. We motored at full speed to try to reach the next bridge by 9;35 when it opened for 15 min. but realised we would be 5-10 min. late so called up the traffic control to hear if there was any possibility to keep the bridge open for us. Reply: "No chance! You have to be in the right place at the right time!" We anchored up and waited for 2 hours with flat fields and farms all around but no piers to let us get ashore. The border control police came aboard asking for papers with identification, destination, nationality, number of passengers and birth dates, motored off and came back with the paper duly stamped and dated. We eventually continued through the Kleine and Grosse Stetin lakes to the polish border where we were met by the polish border control where we gave the same information. The trip will be remembered because of all the herons and cormorants we saw and the the vast expanses of shallow waters, sometimes with less than 50 cm. under our keel even in the dredged chanel! Arriving at Svinemünde meant customs control at the river mouth (Oder). The high swell and concrete pier were not inviting but we were directed to tie up, show our papers and send one person ashore while details were checked. We moored up in the guest harbour Polnocny 53 54, 5N / 14 15,0 E. after 52nm and 10 hours. Everything seems cheap in Poland so far: Museum entrance just over 1 euro, half a liter of beer in a restaurant 1,5 euro, food very reasonable. Harbour charge 16 euro incl. water and electricity. We stayed over en extra day hoping for better sailing conditions . Forcast is for decreaqsing wind in the comming week as the H over Finland moves southwards with warmer weather. Mostly NE winds meaning much motoring up the Polish coast to Gdynia. On leaving Swinoujscie at 6am we called up the port control with no reply so we motored towards the harbour mouth only to hear to sirens followed by 2 green signal rockets. What did that mean? OK or not? Still no reply on VHF so we went back to the nasty concrete pier to be reprimanded again for not eacting to the siren, however they let us go once they saw that there still were 3 aboard. We had an uneventful motor trip, 50nm to Kolobrzeg 54 11 N / 15 33E, arriving early enough to wander in the picturesque city with rivers, fountains and parks among both old and newer buildings and to enjoy dinner at an openair cafe. The main season still hasn't started here, not all facilities are open. We were pleasantly surprised by the town - and sunshine again. Next stop is Leba 54 46 N / 17 33 E, 85 nm along the coast with few harbours. The weather is fine and we're well on the way. We arrived after almost 12 hours at sea motoring parallel with the hundreds of miles of sand and dunes, and were met by a very friendly harbourmaster who talked good English. Leba was the nicest marina we've been to so far; new, very well organised, just by the sandy beach and with trees and flowers all around. Good restaurant too. Several German sailing boats and one British one in the harbour were also on their way N. to Tallin. Very slow internet connection there. Another early start on Wednesday, Gdansk 54 21N / 18 39E being our next port. It took us 9 hours to get to Gdansk 72 nm in good weather with some sailing. Crossing the bay from Hel to Gdansk was time consuming and the sea was choppy. (George W. Bush is coming to Gdansk tomorrow and has meeting with the Polish president in HEL ! ). The marina is in the center of the old town, an hours motoring up river from the harour entry, past dock after dock. The Polish girl at the port control was very friendly and wished us a happy time in Gdansk. Gdansk is a fantastic town, most of the buildings having been built up in their orignal shape and style after the bombing during the 2nd. World War. We've been walking around learning more about the city. There was a big religous parade on 7th., one of the most important days for the Catholics, and all the shops and museums were closed unfortunately. We met many interesting folk, including Jeff an Australian who has been sailing for about 30 years, all over the world. He has kept his boat in Gdansk for 2 winters - very cheap and secure he said. We admire the Polish people for their ability to rebuild the old town, to achieve a higher standard of living and by their obvious pride of being independant and free. They are environmentally conscious and have garbage systems better than in Norway. We left Gdansk and Poland for a longer sail to Klaipeda, keeping well clear of the Russian enclave Kaliningrad.